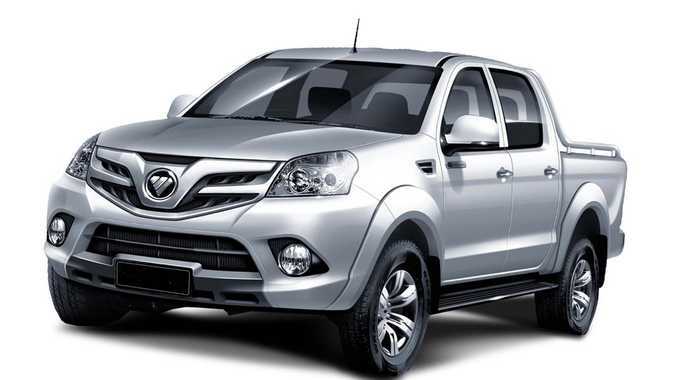 Foton will launch with the Tunland dual cab ute, starting from $28,000. THE newest Chinese brand to take on Australia is aiming high, pitching itself against the Japanese-branded stalwarts in the cut-throat ute market. Newcomer Foton will launch with the Tunland dual cab ute that the company claims is benchmarked against the top-selling Toyota HiLux. Priced from $28,000 (plus on-road and dealer costs) for the 4x2 and $34,500 for the 4x4 the Tunland is significantly more expensive than the rival Chinese Great Wall utes, which start at $17,990 drive-away or $24,990 drive-away for a dual cab diesel that is closest from a mechanical perspective to the Foton. Carrying a price premium of $1000 or $2000 can slow sales at this end of the market, but the Foton is upwards of $5000 more expensive than the rival Great Wall. Many new brands trying to muscle their way into the Australian market have used price and features as a way to tempt buyers who would otherwise have chosen other brands. Chinese brands Great Wall and Chery have tried it in recent years - with Great Wall enjoying impressive sales - while in the 1990s then-new Korean newcomers Hyundai and Daewoo relied heavily on undercutting competitors on price. Foton Australia sales chief Rod James says the pricing is a "sweet spot" in the market, positioning it between the Great Wall and Japanese brands. The brand is targeting 1700 sales by the end of 2013 through its 12 dealers. Foton is relying on its partnership with established brands such as Cummins (engines), Getrag (gearbox) and Bosch (electronics). The Cummins 2.8-litre turbo diesel engine produces 120kW and 360Nm. Fuel economy is claimed at 8.1 litres per 100km. Safety is limited to just two airbags and there is no stability control. The Tunland is covered by a three year/100,000km warranty.